Combining two leading Products, UDA OnCost Estimating CM is designed to be the essential entry-level system for small construction firms. 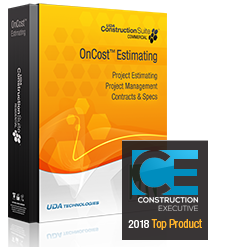 Offering powerful tools for managing projects and contacts, OnCost Estimating CM includes upgraded Estimating, Contracts, Specifications, and Document Management with the new Items Database and ConstructionNet Lite. Get Started in Minutes - OnCost Estimating CM is available for immediate download. Purchase includes ConstructionSuite License, SuiteLink Integration with ConstructionOnline, Basic Support, Updates, and Upgrades. The Latest Software, SuiteLink, and more. latest software releases and Product enhancements.